2 speed clutch bell gear. 15 tooth, 1st speed. Optional. Must use with optional Spur gear to kee..
4-Tec Lower Chassis, Molded Stock part. Replacement lower chassis plate. If you have ran the 4-Te..
4-Tec Side Frames & Belt Tension Cams, L and R Stock replacment parts for the Traxxas 4-Tec(e..
Drive Hub, Clutch/ Pawl & Pin (installed)/ Spring/ Grub Screw. 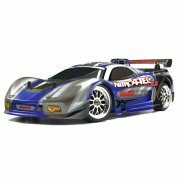 Fits Nitro 4-Tec ..